Doctor Who: "The End Of Time, Part Two"
"The End Of Time, Part Two"
Did anyone else get a little chill when you heard those four humble knocks following the conclusion of the Doctor’s two-front showdown with the Master and the returned Time Lords? Sure, we all knew this was David Tennant’s last episode and that it would end with him turning into an even younger, even floppier-haired Doctor, but it still felt for a second like maybe he could dodge fate. Maybe he could hop back in the TARDIS and keep going. And then came the knocks. The look on David Tennant’s face said it all. The game was almost over. That’s the Tennant-era Doctor in miniature: No matter how high-spirited the against-all-odds adventures, there’s always an element of melancholy just beneath the surface. And here it comes full circle. Before we get into the episode itself—which, frankly, I thought wasn’t really the series’ finest hour—let’s take a moment for Tennant appreciation. Who else could have carried off that mix of goofiness and gravity? That’s no slight to Christopher Eccleston. And I remain optimistic about the Moffatt/Smith era to come in the spring. (Even more after watching the impressive-looking preview.) But this guy… Let’s just say he’s going to be tough to replace. Last week’s episode, “The End Of Time, Part 1” (nicely covered here by Todd VanDerWerff) did a lot of setting up for this week. I’m not sure it quite paid off. John Simm remains an arresting presence, but his Master has become a bit too much the giggling madman, ungrounded apart from his one-on-one moments with The Doctor. The Doctor’s speech might not have been too far off from the, “We’re not so different, you and I” cliché, but it worked. And, honestly, I could have used a lot more quiet, tense moments like that one than all the Gallifrey conference table scenes and running around that dominated the early acts of this episode. The former brought back Phantom Menace memories—particularly the shots of the High Council of Time Lords—and the latter felt a bit like padding. In retrospect, a lot of the business leading up to the final confrontation felt a bit like padding. What was the deal with bringing in Barack Obama last week? (Amazing he could find time in his busy schedule.) Or the Naismith family, for that matter? And, in all honesty, if you’re going to bring in Timothy Dalton and make him look as awesomely intimidating as he does here, can’t you allow him to do something more than just look awesomely intimidating? The big reveal—that the Time Lords plan to bring about the end of time—felt a bit like a cheat too, if only because I can’t get my head around as to what exactly they would do in a universe without time. Just kind of hang out? Maybe we’re better off not knowing their grand scheme. The way the Doctor takes to arms when he learns they’re on their way says a lot. Still, even if what the Time Lords are up to remains a bit vague, they serve the purpose of defining who the Doctor is by showing who he is not. He’s not the kind of guy, a few “Waters Of Mars” moments aside, who will let the power go to his head. I loved his conversation with Wilf aboard the spaceship and his repeated refusals to take the gun that could save his life. He just doesn’t have it in him, no matter what the consequences to himself. 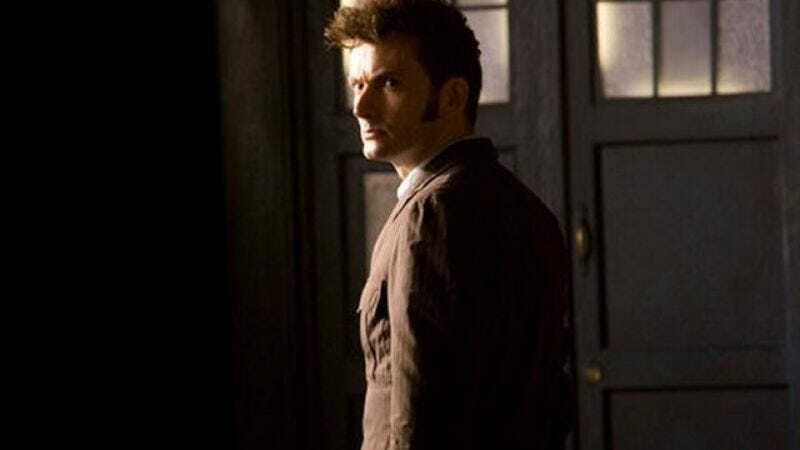 The Doctor, at least the Doctor as beautifully captured by Tennant, is just the sort of fellow who could hang around the cosmos for nine-plus centuries and still be awed by an old codger from London with a yen for adventure. He’s also the sort of person who could put his life on his line to save the universe and then give it up for the same old codger without even thinking of walking away. Or, more accurately, he does think about it and he still accepts his fate. The episode ends with a sentimental journey that would feel indulgent if it didn’t feel earned. The Doctor visits all his old companions one last time, from Martha and Mickey to Captain Jack to Sarah Jane to Donna—shame that Russell Davies wrote himself into a corner and the two don’t share any scenes—to Rose, who sees him for the last time on the eve of meeting him for the first. My favorite visit was the one I didn’t expect: Jessica Hynes showing up as Verity Newman, the descendant of the character she played in the “Human Nature”/ “Family Of Blood” two-parter. When asked if he was happy, The Doctor leaves the question on unanswered. Tennant’s Doctor was a man compelled to explore the universe’s far reaches but, on at least a couple of occasions, tempted to leave them for a bit of the happiness he helped insure others could enjoy. It wasn’t to be and, in the end, he’s not ready to go. It’s not the most joyful chord on which to end Tennant’s run, or Davies’ series-redefining tenure, but it’s absolutely the right chord, a minor-key moment after a long, loud, symphony. And then, per tradition, the next one starts before the decrescendo has fully faded. • Claire Bloom plays…? Speculate. The Doctor’s mother seems too obvious but who else could she be? • Did the Doctor miss anyone of note on his farewell tour? Alex Kingston’s a notable omission, but I have a feeling we’ll be seeing her again in the Moffatt era. • So, Matt Smith: First impressions? 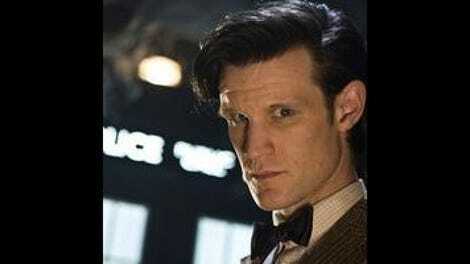 My first thought: The new Doctor will hoot a lot more than the old.